Drilling is a highly dynamic process. Interrelated wellsite systems; geologic conditions that can deviate from expectations; operational variables that require continual adjustments, such as weight-on-bit and rotating speed; and the time lag between near-bit sensors in the subsurface and drilling control systems at surface all make automating a drilling operation as challenging as automating space flight. But driven by the promise of improved efficiencies, higher-quality wellbores, economics and safety, the development and adoption of systems automation is accelerating within the industry. 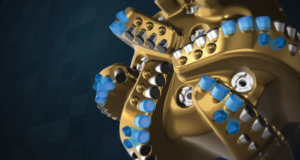 The next generation of drilling systems will have a smaller human footprint and incorporate much more digital instrumentation and automated process control. 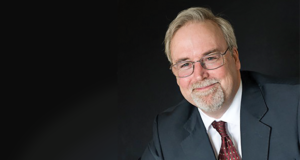 In fact, many of the component “building block” technologies required to make drilling automation concepts a reality are already being proven in the field. Within the “bit-to-enterprise” architecture, downhole data is communicated to the surface, then to remote operations centers and to the enterprise. In this bidirectional communications loop, commands issued from remote locations can be directed to control downhole tools. In more modern digital parlance, the wellsite is the “edge,” and data aggregated at the edge can be transferred into the cloud for remote consumption. An example is the digital infrastructure necessary to facilitate automated directional drilling with remote supervision. By creating an integrated digital network robust enough to reliably transfer real-time wellbore measurements from downhole tools to subject matter experts (SMEs) in remote operating centers, Baker Hughes, a GE company, has enabled geosteered horizontal wells from the curve section to total depth in the Marcellus/Utica Shale play with no directional drilling (DD) or measurement-while-drilling (MWD) experts on the rig. 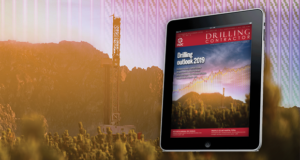 The initial applications of this well-placement technology in the Appalachian Basin demonstrate the potential of drilling systems automation with supervisory control. Not only is the workflow taking service company SMEs off the well site, it also is delivering a step-change in performance, with wells achieving penetration rates in excess of 1 mile (1.6 km) per day. The foundation of the approach to de-manning rigs in Marcellus/Utica horizontal drilling is built on a software and hardware framework for trusted data and communications – two cornerstones of the Drilling Systems Automation Roadmap (DSA-R), a cross-industry initiative to advance the science of drilling systems automation. Subsystems include downhole sensors acquiring high-quality measurements, downhole closed-loop steering (rotary steerable system), automated MWD software designed for remote supervisory control, and a digital communication infrastructure with the capacity to transmit rich datasets. 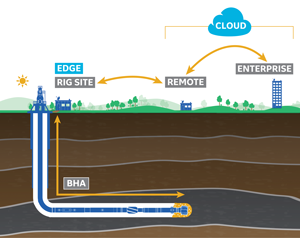 As shown in Figure 1, the “bit-to-enterprise” communications architecture includes the control system that connects the rig to the bottomhole assembly, transmitting measurements from sensors in the BHA and sending commands downhole via mud-pulse telemetry. Wellsite (Edge) systems aggregate data and link the rig site to the remote center. Data are then communicated to the enterprise level with the WITSML nondeterministic protocol. In the future, the architecture is expected to include deterministic protocols, as well as cloud hosting of data, at both the remote and enterprise levels. 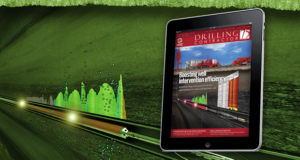 This will simplify data management and the digital transfer of drilling measurements. Directional drilling system automation with remote supervision untethers DD and MWD personnel from the rig site. 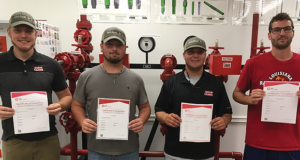 Relocating these experts to operations centers permits them to function in a supervisory mode over the data acquisition, data analysis, decision making and control cycle, while transferring lessons learned across multiple drilling projects – a higher-value use of their technical competencies and skillsets. In the traditional geosteering workflow for US land horizontal drilling, only the geologist is located remotely. On a typical horizontal drilling project, there are traditionally two directional drillers and two MWD engineers on site working in alternating shifts. The industry is adopting different approaches to automate DD software, but the real bottleneck to demanning the rig is the MWD control loop. 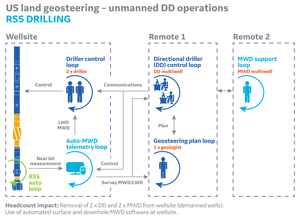 Supervisory DD software can allow one or both directional drillers to be moved to a remote center but keeps MWD processes local to the rig site. 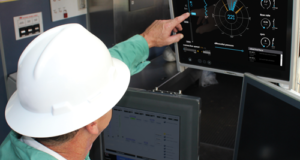 Rather than focusing on the DD software, the solution being applied in the Marcellus/Utica automates the MWD software, making it possible to move both MWD and DD engineers offsite and use conventional DD software. Similar to the airline industry deploying automated procedures to reduce the workload on pilots, systems automation plays a dual role in drilling workflows by conducting minor tasks and accommodating the hand-off of control to and from SMEs based on data visualizations. 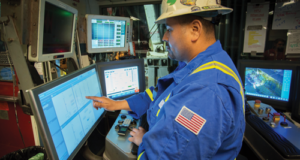 This allows humans to manage, interpret and act on real-time measurements to optimize drilling processes without overloading wellsite personnel with data. 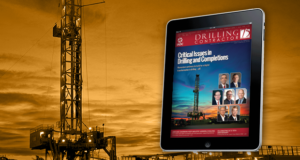 Drilling operations are starved for expertise. With the right digital infrastructure and smart devices, automation provides access to SMEs anywhere around the globe. The workflow also allows the knowledge of experienced personnel to be captured and transferred to new employees and used in training simulators. Of course, HSE compliance drives everything on a well site, and systems automation reduces risk to personnel and the environment by making operations more consistent and predictable, as well as by reducing the headcount in red zones. An alternative workflow can be created with automated MWD supervisory software where directional drilling and MWD SMEs are remote from rig. 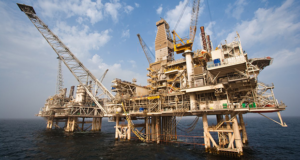 Automation requires high-integrity data measurements both at surface and downhole in the most efficient manner possible for the application challenges. At surface, drilling parameters, such as weight-on-bit and rotary speed, are usually fed into rig contractor control systems. Downhole, the AutoTrak rotary steerable system, which uses the continuous proportional steering method with closed-loop automation control, allows steering with higher resolution than traditional motor systems. These capabilities enable an optimized workflow process whereby the directional driller can remotely drill wells using MWD surveys only for confirmation purposes while delivering reliable drilling performance and smoother, in-gauge holes. Continuous proportional steering technology uses internal hydraulics to continuously regulate the pressure applied by three independent steering pads for precise directional control without artificial restrictions imposed by bit pressures, flow rates or drilling fluid properties. 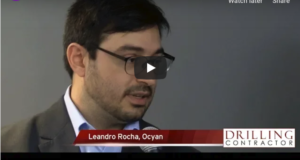 The end result is higher-quality boreholes with less tortuosity and fewer well path deviations, as demonstrated by a Middle East operator’s quantitative study of available RSS systems utilizing high-resolution wireline surveys. The study analyzed more than 700 wells in the same field with similar geologies, trajectories and BHAs, effectively isolating the RSS mechanism as the primary variable in comparing steering technologies in directional drilling operations. The wireline surveys took measurements in 3-in. intervals throughout the wells’ horizontal sections to yield accurate insights into borehole trajectory. The results show that AutoTrak’s continuous proportional steering reduced micro tortuosity by four to six times and consistently delivered better hole quality than either push-the-bit or point-the-bit methods. In the Northeast United States, BHGE has drilled more than 160 Marcellus/Utica wells that have attained footage rates of at least 5,280 ft per 24 hours. Even while these “mile-a-day” (MAD) wells have set new standards for horizontal drilling efficiency in the play, the company has gradually progressed over the past three years toward a fully demanned automated enabled geosteering model for Marcellus/Utica horizontals while maintaining MAD penetration rates. 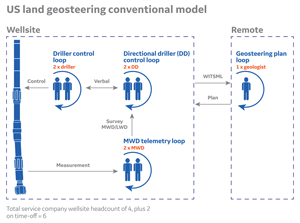 Figure 2 shows a traditional geosteering workflow for US land horizontal drilling with only the geologist (geosteering) located remotely. Figure 3 shows the workflow using the automated MWD supervisory software with the DD and MWD SMEs also remote from the rig. The strategy evolved in stages to run the automated MWD software both remotely and on the rig to first relocate one MWD engineer from the well site to a remote operating center, and then both MWD engineers, and finally both DD and MWD personnel in a 100% supervisory control mode, as illustrated in Figure 4. The curve and lateral sections of more than 50 Marcellus/Utica wells have been drilled to date using the demanned DD and MWD solution, and two of the wells in Pennsylvania have been MAD wells. 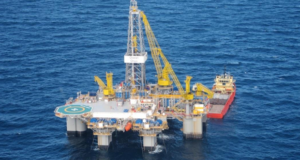 One of the earliest wells drilled with no DD or MWD service company personnel on the rig recorded footage rates in excess of one mile a day using a motor-assisted AutoTrak Curve high-buildup rate RSS. That likely would not have been possible had the geosteering and geology experts not been located in the same remote operating center to collaborate in orienting the well within the formation and drilling it in 3D space. The curve and lateral sections of more than 50 Marcellus/Utica wells have been drilled to date using the demanned DD and MWD solution, and two of the wells in Pennsylvania have been “mile-a-day” (MAD) wells. On the later well, the automated MWD software was used with the AutoTrak Curve RSS to drill more than 6,680 ft in 24 hours – a new daily footage record for the operator. 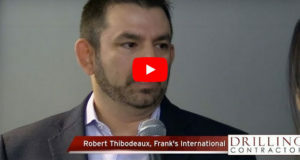 In this case, the directional drillers were in the client’s regional office, and the MWD SMEs were in Houston at a 24/7 remote operations support center. 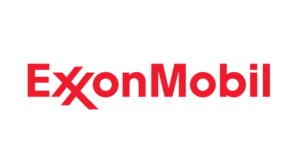 The Houston team remotely analyzed the MWD performance while also monitoring operations on wells being drilled in other regions at the same time. Remote operations play a significant part in the application of factory drilling – lean manufacturing processes. Some high-build-up rate rotary steerable systems, such as AutoTrak Curve, have moved over time from a growth product to a mature product and service as part of their lifecycle. Demanning of DD operations is a result of the optimization of the tools and service. 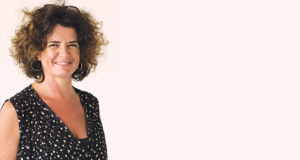 Operators can now apply lean principles by outsourcing technical expertise, such as DD. 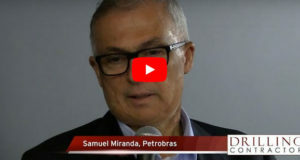 In this example, the operator has shared the task of wellbore placement with the service company and collocated personnel to enable collaboration of all of the decision makers who place the wellbore along the planned path. 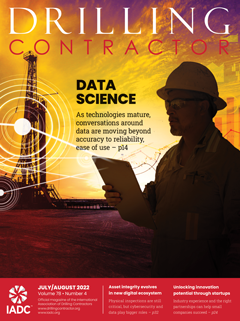 Automated steering, automated MWD and robust data communications enabled the move of the directional driller from the site to office, simultaneously moving the directional driller up a level in the decision process. The location of the directional driller in the office in close communication with the client’s experts is analogous to insourcing and collaborating by lean manufacturers, and this organizational transition has created simultaneous improvement in product quality (the wellbore) and efficiency (ROP). The impact of this approach is significant. In addition to mile-a-day performance, the approach is credited by the operator with an increase in lateral footage per well of 14%, an increase in in-formation steering from 93% to 97%, and a reduction in wellsite personnel of 46% from 70 to 38 over 10 rigs. Not every well will achieve mile-a-day performance, but the Appalachian Basin wells demonstrate how combining automated systems under supervisory control, real-time MWD measurements and advanced continuous proportional rotary steerable capabilities can optimize penetration rates and achieve consistent lateral placement with no geosteering personnel on the rig site. The next step is using automated RSS supervisory software to permit DD crews to collaborate remotely on multiple wells, similar to the MWD crew in the Houston operations center. This will help further improve results in the curve and lateral sections of horizontal wells. AutoTrak is a trademark of BHGE. This article is based on a presentation at IADC World Drilling 2018, 19-20 June in Copenhagen, Denmark.